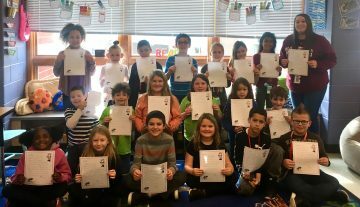 Before the holiday break, both Salisbury and Paradise Elementary participated in writing letters to raise money for children with chronic illnesses. Every year around the holidays, Macy’s partners with Make-A-Wish for their “Believe” campaign. For every letter written to Santa, Macy’s will donate $1 up to $1Million to help make as many wishes come true for these children. Combined, Salisbury & Paradise Elementary staff and learners wrote a total of 455 letters, which were then dropped off at the “North Pole Mailbox” at Macy’s. Simply by writing letters, their elementary schools raised $455 for children in order to help their Make-a-Wish wishes come true!